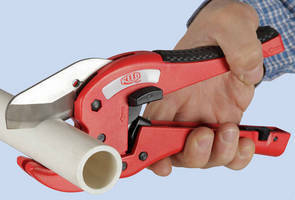 Reed Ratchet Shears with hardened steel blades are ideal for cutting plastic pipe. New RSP1 Ratchet Shears are also great for CPVC because of blade thinness and finish. RSP1 shears also cut PVDF well. The pointed blade in the one-hand RSP1 model helps start the cut in tough plastics such as CPVC, and helps avoid bounce in thin wall material. Blades on Reed ratchet shears can be sharpened or replaced, enhancing performance and saving money. These tools are not disposable. They are of sturdy quality and perform better, longer, and for less money over the tool's lifetime. 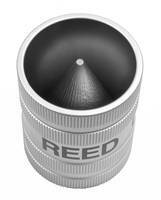 REED PDEB250 Cone Chamfering Tool comes with hardened steel blade. 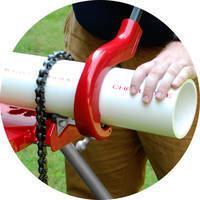 R450PAL Reed Carry Light™ Tripod Vise comes with aluminum legs. 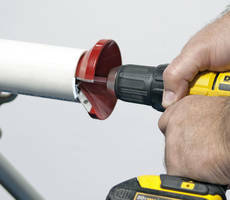 Power Pipe Beveler is equipped with 4 Amp Lithium-Ion battery. 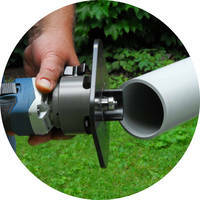 Clean Ream Plus Plastic Pipe Fitting Reamer guarantees 250 or more reams. 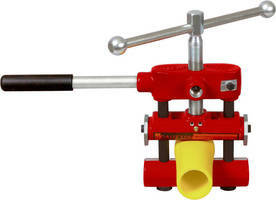 PE Squeeze-Off Tools are available with metric stops.